This narrative was being further etched in stone after every passing season until last year when he was forced to miss the entire season due to a torn labrum in his hip. Suddenly, with the dreaded age of 30 approaching, a shadow of doubt was cast over Chandler’s game. Some wondered if he would ever return to his previously productive self. Considering you are like most people and read the title of this piece before getting to here, it isn’t breaking news to say that Chandler has made a successful return. What is news is the fact that Chandler has made a successful return and then some. Although Chandler’s aforementioned scouting report largely remains the same, there is one word that now needs to be removed by said stone etcher – complimentary. Through about a quarter of the season, Chandler is averaging career highs in scoring (18.6) and rebounding (7.6), and is coming off of a month of November in which he averaged 20.2 points per game and 8.3 rebounds per game on 38% shooting from 3. A starter for most of his career, the DePaul product is now leading the Nugs’ bench unit, but is still playing starter level minutes (29.2 minutes per game). He leads the 8-14 Nuggets in scoring and field goal attempts, and is near the top in field goal percentage and rebounding. The season he is putting together epitomizes that of a Comeback Player of the Year. The only problem with that is the fact that the official NBA award ceases to exist. What Chandler may make a case for instead are the Sixth Man of the Year or Most Improved Player awards, both of which still do exist. He’ll certainly have to continue his strong play to do so, which is something Chandler isn’t necessarily known to do. 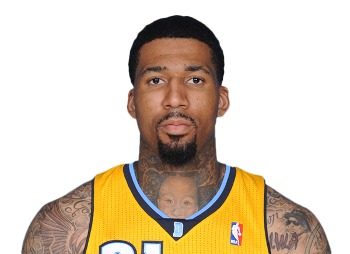 Writing anything conclusive about Wilson Chandler does not come without inherent risk. Yes, he has put up consistent statistical seasons, but Chandler has been a statistically volatile player game-to-game throughout his career. There is a decent chance that after reading this you will pay more attention to Chandler and come away wondering how in the world he is posting his current averages. I distinctly remember sitting courtside a few years ago at a Nuggets-Bucks game (for $50 mind you…gotta love Milwaukee) in which Chandler was an absolute force. He was perfect from deep and used his 6’8” 250lb frame to score effectively at the rim. He also locked down any Bucks player who dared to put him in an isolation on defense. Sitting courtside, I was awestruck by a guy with whom I had been only moderately familiar. With my attention grabbed, I tuned into Chandler’s next stretch of games. In these games, he averaged 8 points on 26% shooting, and also displayed some of the spacy off-ball defense that he is known to display from time to time. How did Chandler follow that four-game stretch? The only way Chandler knows how. Over his next four, he posted a 20 points per game average, which, when combined with the previous five games, resulted in a 13.9 points per game average over nine games – Chandler’s career average to the tenth of a point. This type of consistent inconsistency has marred Chandler’s career thus far…until this season. Chandler’s productivity has always largely been derived from his ability to shoot from 3 at his size. This creates problems for a lot of defenders, especially because Chandler can shoot over contests in addition to when he’s open. This also allows him to attack closeouts almost at will, where he can utilize his mid-range versatility and finishing prowess to score at a relatively high rate. Part of his problem in the past, however, has been his over reliance on taking the 3-point shot. In 2013-14 and 2014-15, Chandler’s previous two seasons in the NBA, 43% of his shots attempted were 3-pointers. For a player with a career average of 34.1%, this is probably too high of a percentage, especially considering the other ways he has proven he can score. This season, Chandler is taking just under 30% of his shots from 3-point range, while shooting a higher number of shots in the paint, where he has scored over 46% of his points so far this year. However, one must remember that this is a guy from whom basketball was taken away for an entire season due to an injury that has a full recovery period of 5-6 months, but likely allowed him to resume basketball activity in just 3-4 months (I had the exact same procedure done, therefore can attest to this reasonableness of this recovery timeline from a basketball standpoint). Chandler was uncharacteristically emotional when he learned of his fate at the beginning of last season, stating, “In the past when I’ve had surgery I’ve been down, but never got teary eyes like this. Definitely heartbreaking, especially after the summer I’ve had.” Make an already emotional player sit and watch his team lose almost 50 games and there undoubtedly is some procurement of additional motivation. Combine the motivational element with the fact that Chandler was more than likely able to put in a full off-season of work, and suddenly the shooting improvement isn’t as surprising. There seems to be an advanced stat for everything nowadays, but there isn’t anything that measures a player’s determination in situations following adversity. I suspect Chandler would rank high if there were. Nonetheless, Chandler is a bona fide NBA rotation player with a team friendly 3 years, $36 million left on his contract. For a team as in need of a star player as the Nuggets, Chandler represents a legitimate trade possibility for a contending team looking to bolster its bench, especially if he is packaged with Will Barton or Danilo Gallinari on his expiring contract. Would this alone land them a star player in return? Of course, not. However, it could potentially land them a promising young player or a future 1st round draft pick. It would also allow them to bottom out ahead of a talent rich 2017 draft class, and escape the revolving door of mediocrity that traps many NBA teams who chase meaningless wins1. The Nuggets have been a culprit of wins-chasing, but they’ve been fairly unsuccessful in doing so this season. As such, there is a “Good Stats on a Bad Team”2 vibe associated with Chandler and his numbers on the 8-14 Nuggets. Players labeled with this distinction aren’t often rewarded with post season awards, which will make Chandler’s pursuit of either the Most Improved Player or the Sixth Man of the Year awards difficult. There hasn’t been a Sixth Man of the Year recipient who played on a team without a winning record since Dell Curry in 1993-94 (Yeah, Steph’s dad could play too), and while winning hasn’t been as much of a pre-requisite for Most Improved Player votes, Chandler likely won’t have a large enough scoring increase to outweigh the fact that he is such a known commodity to voters at this point in his 10th season. Given the amount of effort that Chandler has put into this stellar comeback season, however, I figure it’s my duty at this point to go beyond presenting his game as I have, and briefly make a case for his Sixth Man of the Year campaign. As the Sixth Man of the Year award has always been centered around scoring, let’s start there. The main challengers to Chandler’s quest at this award are Lou Williams and Eric Gordon. Williams has been scorching hot as of late, and leads all qualified bench players in scoring. A former Sixth Man of the Year award winner himself, Williams has been surprising efficient in the way he’s gotten to his 18.7 points per game mark. Scratch that – suspiciously efficient. Lou Will has shot 41% or higher from the field only once in the last six years. This year, however, Williams sits at a solid 45.7 FG%. History says this will regress, and I’ve always liked history. Because Williams is less likely to carry the burden as the Lakers’ leading scorer as efficiently as someone like Chandler, and the fact that the Lakers are unlikely to finish the season with a winning record, let’s cross him off (side exercise here, bear with me – when I say go, close your eyes, take two deep breaths, and then try to imagine a world somewhere far, far away in which individual defensive impact is considered when evaluating candidates for the Sixth Man of the Year award. Okay, go…What a beautiful place, huh?). That leaves Eric Gordon. Plugged into the Houston Rocket’s bench rotation after the return of Patrick Beverley, Gordon has flourished. He is among the leaders in bench scoring and is doing it efficiently. Playing on a team destined for 50 wins, it appears Gordon may run away with this award; however, he is significantly behind Chandler in one very important SMOTY category, and that category is his body of work. Like, literally, his body of work – aka his tattoos. I know this might sound crazy, but hear me out. When looking back at recent Sixth Man of the Year winners, it is pretty clear that voters have started to vote for players with extensive body artwork. 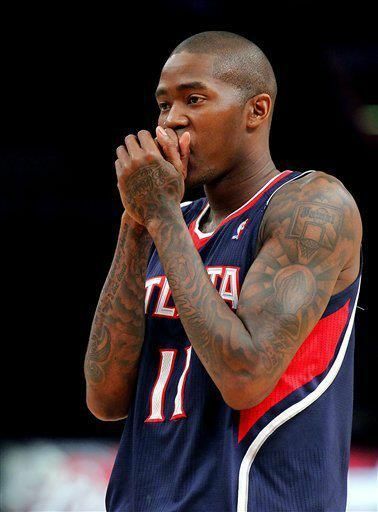 Jamal Crawford? check. Lou Williams? yup. J.R. Smith? This might just be a base layer at his current pace. These guys represent the last four SMOTY awards, and only Smith, I would argue, has the artwork that is on the same level as Chandler. Chandler’s body of work includes an assortment of cartoon characters that include Beevis and Butthead on one calf, and Kenny from South Park on the other. His entire back is consumed with a depiction of the Juggernaut character from X-Men, and he pays homage to hip-hop legends N.W.A. on one of his shoulders. Finally, the best of them all – the portrait of his daughter, Jaya Dior, which you may have noticed on his neck. The tattoo is so well done that, upon first glance, one might think that she is actually physically strapped to Chandler’s chest, barely peering over his jersey as if she is timid, but curious as to what it looks like to fly through the air and dunk on giant human beings. And if that isn’t impressive enough, well, at least Chandler likely has the better fishing story. Chandler’s body of work is impressive, but in all seriousness, his figurative body of work probably isn’t going to be impressive enough for voters to overlook the fact that the Nuggets just aren’t very good. This is the unfortunate reality. However, if Chandler is able to sustain his current level of play, he will have a realistic chance to win the Comeback Player of the Year award voted on by the NBA Players’ Association after the season. An award from one’s peers certainly carries weight, and I’d like to think it would carry plenty in the mind of Chandler if he were to win it. If not, at least he caught a feature story by a random guy from Wisconsin. That has to be worth something, right? 1 – Teams that have a) above average talent without star player or b) a star player without above average talent often find themselves in the revolving door of mediocrity. Teams stuck in this door are good enough to make the playoffs or come close, but not bad enough to receive a high enough draft pick to sufficiently improve their roster. The Nuggets are dangerously close to stepping into this revolving door. Yes, there are ways around this (trades, free agency, unforeseen player development, etc. ), but the path of least resistance for the Nuggets to acquire a star is through the draft. At 8-14, they might as well start that process now and get the losing over with. 2 – The “Good Stats on a Bad Team” concept implies that no matter how bad an NBA team is, stats will still be accumulated, thus potentially inflating the worth of that team’s players. Passes are still made, shots are still taken, and rebounds are to be had. An average player on a bad team can look good in an environment where he is given the opportunity to accumulate these stats, but it doesn’t mean these stats are translatable to games of higher intensity with better players. Think former Rookie of the Year Michael Carter-Williams on the 76ers. His 16.7 points, 6 rebounds and 6 assists that he averaged for the putrid Sixers squad in 2013-14 certainly hasn’t translated. Wilson Chandler is certainly not near this level of “Good Stats on a Bad Team”, but the fact that he is on a bad team may plant that idea in enough voters’ minds to negatively affect his chances at a post season award.